On Saturday, my girlfriend Carol and I skied up the unplowed Whiteface Veterans Memorial Highway. From the tollbooth to the end of the road it’s a 5.4-mile climb, long but not very steep. It took us roughly three hours. Of course, the descent is the fun part. It normally takes less than an hour. Because there was so much powder, our downhill run took a little longer. In places, the skiing was almost too mellow, especially between the two hairpin turns. Often we pushed with our poles to sustain momentum. Since this was Carol’s first time skiing the highway, this was OK. 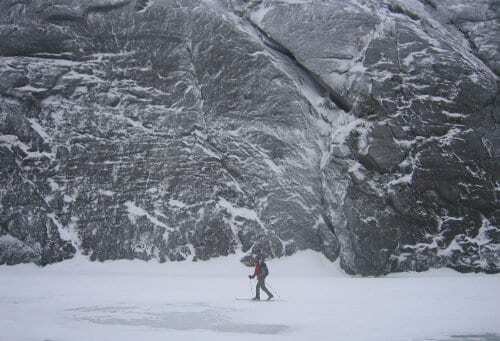 When conditions are thin and icy, the descent can be fast and a tad scary. 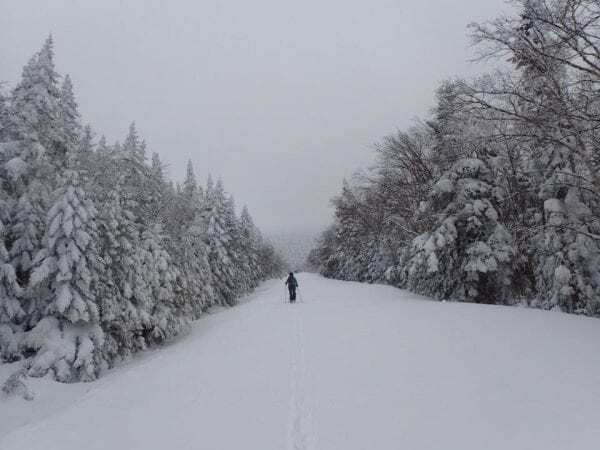 After we finished, I skied the first half-mile of Poor Man’s Downhill, a mountain bike/snowmobile trail that starts a bit down the road from the tollbooth and ends in Wilmington. Carol picked me up at Marble Mountain Lane, where this section comes out. Carol and I had skied this part of Poor Man’s Downhill the previous weekend as well. It was definitely skiable, but we had to avoid rocks. Last weekend, there was much more powder, and the rocks didn’t pose as much of a problem. What a great start to winter, I thought as I plowed through the snow. Alas, the following day it rained. With some trepidation, I took my skis to Dewey Mountain Recreational Center in Saranac Lake on Monday afternoon to see how conditions had changed since I had skied there last week. Dewey’s lower trails are groomed. I expected they’d be fine, and they were. I was more curious about the ungroomed trails on the top of the mountain. These are similar to trails you’ll encounter in the backcountry. The good news is that we didn’t lose much snow. However, it’s now a hard crust, and the tracks from last week are frozen. These are not the best conditions for turning, but I was able to ski down from the top without difficulty. The other good news is that the rain solidified the base. With six inches of fresh powder, conditions would be even better than they were last week. We don’t have any big snowstorms in this week’s forecast, but we may get a few inches. Even that would help.